Anybody got an update from the EURO?? these are 10:1 ratios so you could nearly double this for more realistic expectations. I was trying to remember the last snow over 3 inches was for me and i Believe it was over three years ago. What was everyone else’s? Before that, it was February 2, 2016. We normally have at least 3 or 4 a year, with one or two 6" events. Last snow over 3"? 2 weeks ago to the day. 6" on 12/29/17 which was the highest individual snow event here since I believe 11/20/15 when we got 8" in the Iowa City/Cedar Rapids area. I'll always remember that one for the awesome videos of Kinnick Stadium being cleared for the game the following day. Not sure of the exact date; as calendars had not yet come into vogue. I am not sure where the readings are taken in the Gary, Indiana area but Gary is on the south end of Lake Michigan so for them to get a good lake effect set up there would have to be an almost due north wind and that is the least likely wind direction. However, that said when that set up occurs then they would do very well on most set ups. One limiting factor is that area is flat and without some hills there is less of a lift. Note South Bend that is east of Gary has a seasonal average of 65” Over here in Michigan some areas if the far eastern side of the state near Detroit also only average around 30” a season. Latest we've had was a 19 incher back in the 60s I believe. Wish they'd offer a good way to segregate systems. Like an option to show hr48-72 for example. Most of that for mby is today's event. Either way, I need this to stay north to get a useful wind fetch off of Lk Mich. So far, looks like winds would stay too SWesterly, vs W or WNW. This will be a minor 1-2" deal if that happens. I will be glad if Tom and others that have been shafted score good tho! Last 3+” event was yesterday. Last 20+ event was Oct 31-Nov 2 1991. That was the Twin Cities biggest snowstorm on record....28”. I wasn’t living here, but my wife was. She said it was the best 3 days of her life. She’s a snow lover like me. Basically correct. They took readings at the Detriot City Airport from 1948 - 1982 and the mean snowfall was just 32.6" over those 34 years; and there are probably a couple of other spots in far SE Michigan; in very unfavorable spots to benefit from any of the 5 Great Lakes; that have a similar average. Since that airport is in a highly urban environment; a reduction in snowfall would be normal. On second check; it is 6 miles NW of Detroit; so the degree of urbanization might not be quite so profound; but airports still usually report less than the surrounding countryside because of all the activity related to machines & humans in the area. The airport is only 50 or so feet higher than Lake St Claire; and so there is not much benefit from altitude...it is one of the lowest spots in the Lower Peninsula. Wow this clipper pattern blows for us Nebraskans again. lol. Surprise surprise! Doesn't look AWFUL. At least here. Omaha gets less. GFS has about 2" in Lincoln between the two. The MLK one is still mostly a miss, but a smidge better than previous runs at least. I think the NAM is way too warm on the MLK one. There's a random unjustifiable warm pocket showing on the NAMily, and once that trends down we should see slightly higher totals. Unless GFS is right and Lincoln almost completely misses out on the band. Not that it means much, but OAX isn't buying any non-snow precip chances either. Looks like Indiana, most southern parts of IL and parts of CMI is the winner on the GFS. I remember that storm. Was living in NYC at that time and even we on the coast had some mixing going on that early in the season. We called it the "Halloween Storm". Anyways, it was a great storm, especially for you guys. 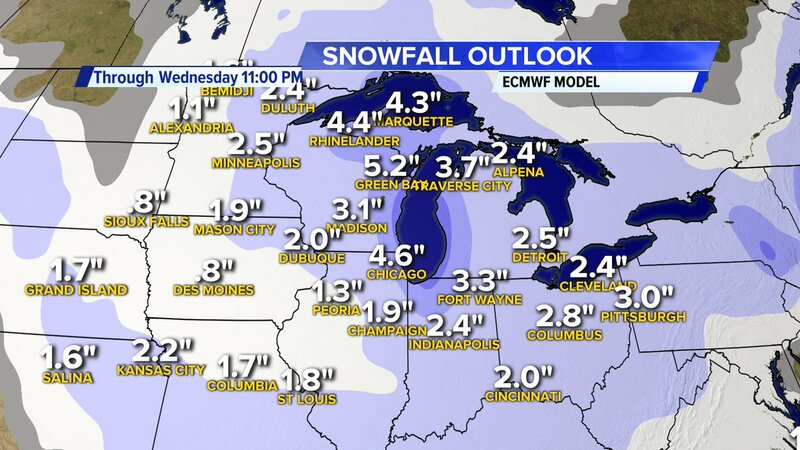 Not a thrilled w early season or late season snowstorms though. 00z Euro...pretty much a 1-3" event, but if the meso low that the models are showing coming down the lake on Tue/Wed does something funky, then lakeside counties can score a surprise. Other than that, prob just enough to change the landscape and whiten up the ground. 2-3” still looking good here. A few of the CAMs including the NAM are starting to show a few 4” pockets in the area. 3” is my minimum for firing up the snowblower so let’s make it happen. Little Sable Pnt along Lake Michigan looks to be targeted by that plume! 1.2" qpf could fluff to a 15+ hit right there. Gorgeous spot there with the Silver Lake Dunes as a unique natural setting. Busy in summer, but I love hiking them in the off-season. The dunes are up to 100 ft tall and the region is about 1 by 3 miles in area. Hard work walking in sand tho. Better when they get a little winter moisture and freeze with a solid crust. But that's usually when we have tundra conditions and the brutal winds get ya! 2-3" is one of your more solid snow-casts this season, correct? My concern is that sans decent help from the lake, this will be a cold pixie dust event over here, and you can halve those amts in that case. Iirc our first clipper was also one of these "dive-downer" types. While that turned out positive over this way, we aren't at the beginning of December coming off of a warm regime. This is Jan and the atmosphere is seasonably less moist. Anything over 2" in Marshall I'll consider a win. Best of luck to ya! Convection-Allowing Models, such as the HRRR, RGEM, 3km NAM, etc. Basically another name for ‘short term’ models that can pick up on smaller mesoscale features that the globals struggle with. Love how both systems split omaha lol. And monday system forms north splits apart over omaha then reforms south. This outta put 1-3" IMBY, but who knows. We will see what happens! 12z Euro/EPS both came in a bit wetter across WI/N IL, esp near the Sheboygan/MKE area as it's seeing a better set up for LES on Tue/Wed. It's also seeing this feature swing down into NE IL/N IN. Something to monitor as we get closer. 18z NAM seeing this increased snowfall across E WI...models didn't do quite well with Friday's LES in Chicago at this range so as is the case with these meso low's it will basically a now cast deal. Get ready to fire it up...you are looking golden there with this one. Maybe an overachiever. more into hires model time domains. 18z GFS came in much wetter, especially for those in WI/IL. GFS would double our seasons snowfall total! That’ll be determined after it’s done snowing and I open the garage door. Haha. I don’t want this snow at all, so I’m sure we’ll end up with 3 or more inches. They have lowered my accumulations now. From a ridiculous 1-3" from previously is now an inch. I don't like garbage snows, so I am all for it. (1-3...2-4 and sh*t means nothin). Hopefully, others on here can score better w this sucka. Another step up from the NAM. Looking like a decent event for our WI/IL posters. Expecting ~2" out here. Nice trends this evening...both 00z NAM/GFS trending wetter for many of us on here...widespread WWA's on the table??? In fact, if you live near the lake in WI/IL, there's a good chance that you may score some additional Lehs Tue into Wed. If this feature holds into 12z Monday's runs, I'll believe it more, but I'm starting to like the idea of possible 6"+ totals lakeside in WI locals. I'm not jumping on board just yet for NE IL posters.